Carnivorous pitcher plants, pygmy conifers, and the Tiburon jewel flower, restricted to a small patch of serpentine soil on Tiburon Peninsula in Marin County, are just a few of California's many amazing endemic plants—species that are unique to particular locales. California boasts an abundance of endemic plants precisely because it also boasts the richest geologic diversity of any place in North America, perhaps in the world. 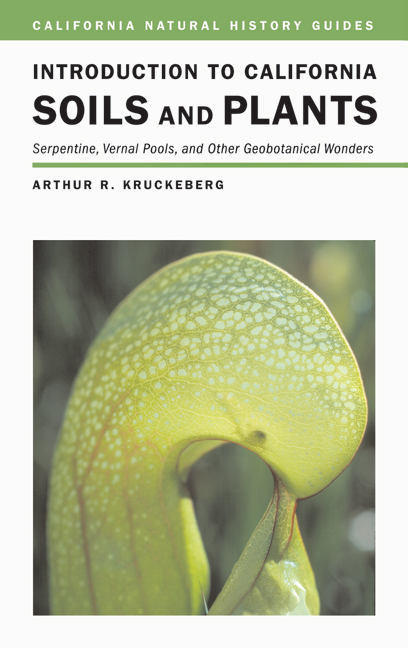 In lively prose, Arthur Kruckeberg gives a geologic travelogue of California's unusual soils and land forms and their associated plants—including serpentines, carbonate rocks, salt marshes, salt flats, and vernal pools—demonstrating along the way how geology shapes plant life. Adding a fascinating chapter to the story of California's remarkable biodiversity, this accessible book also draws our attention to the pressing need for conservation of the state's many rare and fascinating plants and habitats. Arthur R. Kruckeberg, Professor Emeritus of Botany at the University of Washington, is author of Best Wildflower Hikes: Washington (2004) Geology and Plant Life (2002), Gardening with Native Plants of the Pacific Northwest (1996), Natural History of Puget Sound (1995), and California Serpentines: Flora, Vegetation, Geology, Soils (California, 1985).